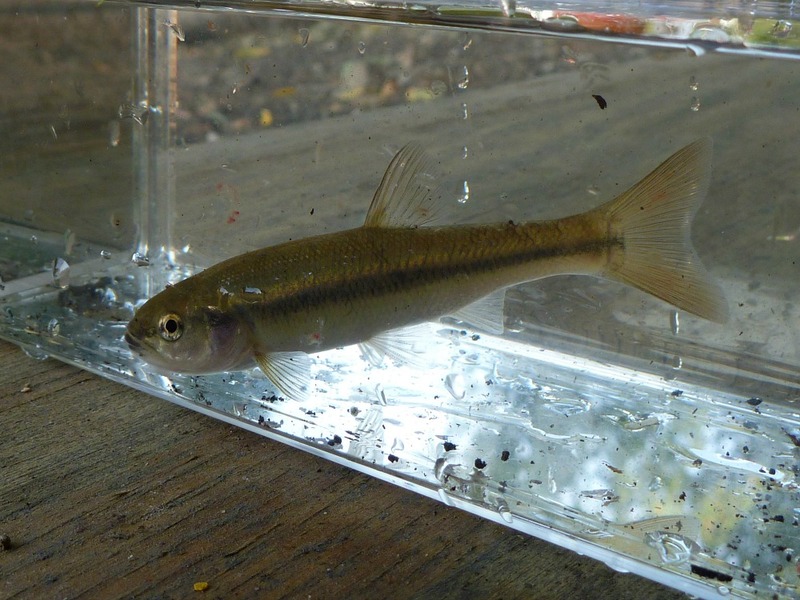 This report will be filed under micro fishing trip reports and keiryu trip reports. One of the nice things about renting a car rather than taking the commuter train to go fishing is that I can easily go to more than one spot. The plan for the day was to start on one suburban stream where I had caught micros before, and then go to a different suburban stream that has a good population of wild trout for some "zero" fishing. What prompted the micro fishing portion of the trip (beyond the fact that I just hadn't done it in a while) was a post on the Tenkara Micro Fishing Facebook page asking about a tanago bait shown on a YouTube video. Luckily, the recipe was written out rather than just spoken, so after a while searching through a kanji dictionary I was able to figure out the recipe (kanji are the characters - what the Japanese call "Chinese characters" - that make up the core of Japanese writing). The bait shown in the video was a paste that was made from one teaspoon of egg yolk, two teaspoons of flour and three drops of vanilla extract. I decided to make some and try it out. It turns out we didn't have any vanilla extract so I substituted Grand Marnier. I figured it would add both odor and flavor. The fish seemed to like it! I had imported a gel tanago bait some time ago, but people complained that it didn't stay on the hook well. 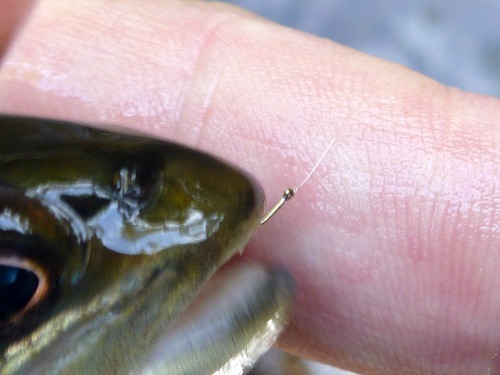 I think that may be because people here frequently cast to micros rather than just fishing nearly under their rod tip like tanago anglers do in Japan. Still, the gel really didn't stay on the hook well so I stopped importing it. The egg and flour bait is pretty sticky, though, and I found that it does stay on the hook nicely. 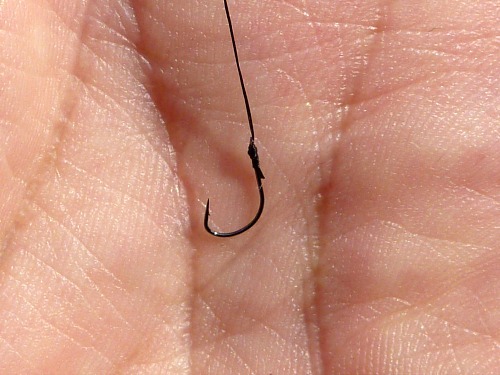 It is just a bit tricky to get onto the hook, but I found that if you use the hook almost like a scoop, and scoop up some of the bait in the bend of a tanago hook it works pretty well. The best thing about it is that it works! I had found a spot on the stream where a shoal of micros were milling about in maybe 4-6" of water. Using a 13' rod and no more than about 5' of line, I lowered an Owner Smallest tanago hook with some of the egg and flour bait into the shoal and got a hit within a second. I wasn't really casting per se, but the second and third "casts" also yielded fish almost immediately. 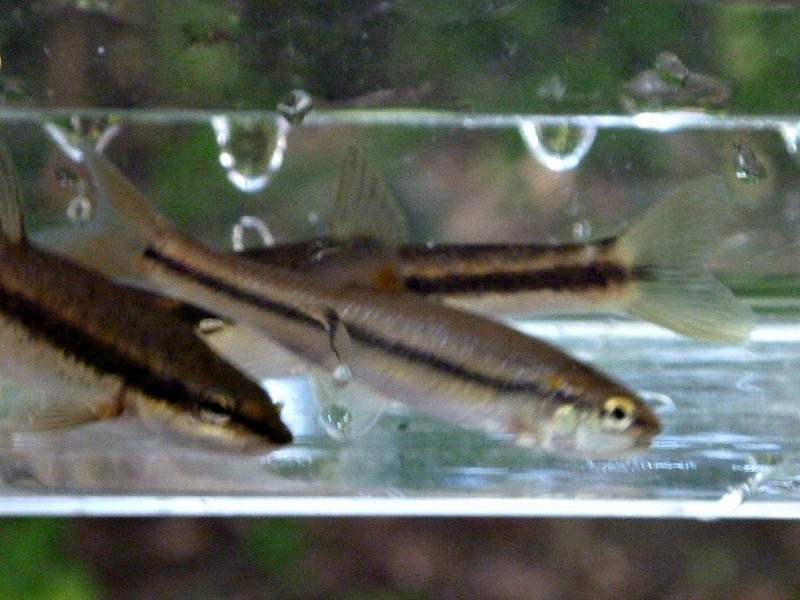 After three "casts" I'd caught a creek chub (right front in the photo above) and two blacknose dace. After the three fish in quick succession, I moved to a different spot on the same stream, where I had caught slightly larger creek chubs in the past. I misjudged the distance and the current on my first "cast" and put it in the weeds. The second "cast" yielded the creek chub shown above. As much as I say the Kurenai HM30R is a great micro fishing rod (and it is), don't discount the usefulness of a longer rod. The Kurenai HM39R is just long enough that in many cases you don't have to cast, and you can place the bait or fly precisely where you want it. 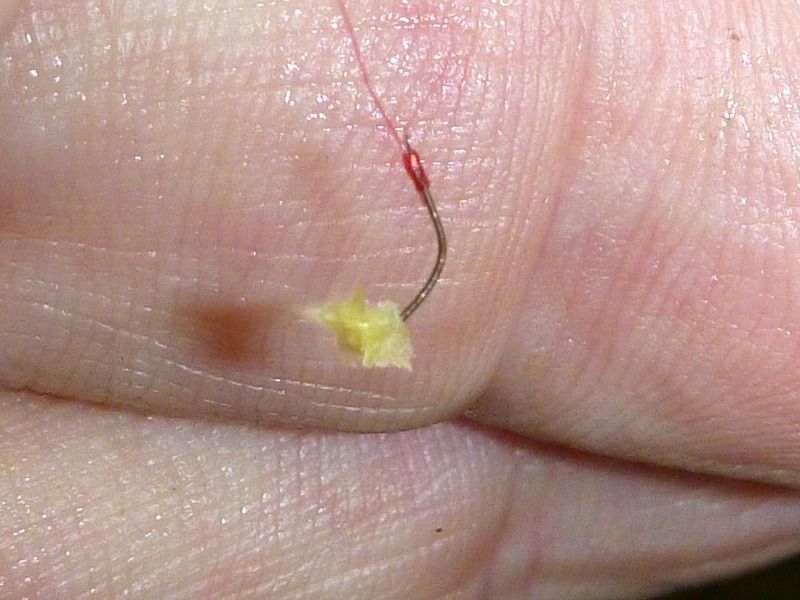 The micro fishing was certainly successful and I will use the egg and flour paste bait again. I made one batch of the bait, froze half and took half with me. I could have cut it in tenths and just taken one tenth. It really takes only a little bit of the bait to cover the hook point. I'm sure I could have fished all day with just a quarter of the bait I took with me. It proved to be a good bait. It's easy to make, it's inexpensive and it's made from readily available ingredients - and if you don't have Grand Marnier, feel free to substitute vanilla extract, although I cannot guarantee that it would work as well ;-). I think I could have stayed there and caught dace and chubs all day long, but I also wanted to try out some zero fishing. In my rod reviews and trip reports, I have frequently mentioned zero fishing but I haven't frequently done it. 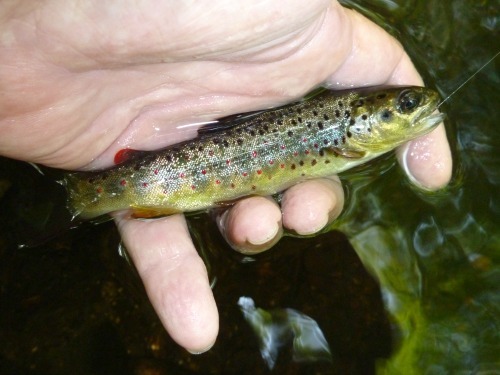 Zero fishing is a niche within keiryu (mountain stream bait fishing) that is the ultimate in ultralight. In an attempt to add as close to nothing (zero) to the natural bait as possible, zero anglers use small, light wire hooks, the minimum amount of added weight to get the bait down to the strike zone, and fishing lines that are as thin as or even thinner than the Varivas 10X tippet. They use a rod that is soft enough to protect 10X tippet and to bend easily when the fish hits so that it will feel no tension on the line. With that set up, the drift you can get is as natural as it is possible to achieve (and still have a hook and line attached). It is extremely effective. One bit of advice, though: with such a small weight you will need to cut the tag ends of your yarn markers quite short to minimize wind resistance. Otherwise they will impede your cast. Suntech has four rods that are rated down to 10X or less, the Kaname Special, Fine Power, Aoi ZPRO and the recently introduced FMX Keiryu ZPRO. Those are all long rods, though. To get as close as you can to zero fishing with a shorter rod, the Suntech Kurenai and also the GM Suikei Keiryu Special are rated for 9X tippets. On Saturday, I started out with a ZPRO, a main line of 8X, a tippet of 10X, a single size 10 Dinsmore shot and a Tiemco 518 size 32 hook. I found the fish took very readily, and the size 32 hook was reasonably effective in hooking the fish. Later in the day I also used some Daiichi 1110 size 26 hooks with the same result. I did miss some takes, and probably would have hooked more fish had I used a slightly larger hook. For a while I also fished with a Gamakatsu Zero Yamame, an extremely light wire hook designed for zero fishing. It did seem to produce more reliable hook sets. As a separate experiment, I tried using black thread in place of tippet. The Gamakatsu Ultimate tanago hooks are snelled to black thread rather than nylon mono. It doesn't seem to reduce their effectiveness. Also, I recently purchased a small tin box from Historic Angling Enterprises similar to the one that George Washington used to hold his fishing kit. His hooks were snelled to a silk line that was considerably thicker than modern fly line backing. Paul W. Jones, the owner of Historic Angling Enterprises has told me that he regularly catches brook trout using the same surprisingly thick silk snells when in the mountains on his reenactments. On Saturday, I caught fish with both worms and Killer Bugs using black fly tying thread instead of tippet. That said, I did catch a lot more fish using the 10X tippet than the black thread. I only broke the 10X tippet once on a hook set. By the way, anyone who is having trouble moderating an overly aggressive hook set should try fishing with 10X for a while. It will cure the problem very quickly! I did have two fish break off after I landed them, though, as they flipped out of my hand when I was trying to take a photo. Even a pretty small fish will break 10X if it flips out of your hand and the tippet pulls tight before the fish hits the water. I should take more photos like this. The fish seem to be a lot more relaxed when held right at the water's surface, where they're wet and can can get some water over their gills (other than the two seconds it takes to lift the fish and take the shot). When fishing with 10X, it will save a lot of rerigging. I didn't catch any big fish Saturday. 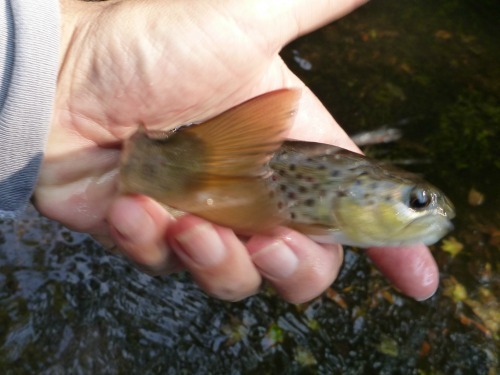 The stream I went to is very productive and holds lots of wild fish but they are almost all quite small. The stream has a very few surprisingly large fish, as does nearly any stream that supports excellent natural reproduction, but the big ones I have either caught or hooked and lost were in very tough lies (and were all hooked when the water level was considerably higher than it has been lately). It's probably just as well. I do not think 10X tippet is appropriate for fish much bigger than those I caught on Saturday. I have read more than a few posts (from non tenkara anglers) on fly fishing forums expressing concerned that tenkara fishermen would play a fish to death because they don't have a reel. Their concerns are misplaced, but I do not want to fortify their concerns by advocating tippet lighter than is appropriate for the fish you are trying to catch. The rods that are rated for 9X or 10X will protect the light tippets extremely well, but there is no need to baby a fish. 10X tippet is a bit over 1 lb test. It is very hard to put 1 lb of pressure on a fish with a very soft rod. I don't think you could lift a 1 lb weight with one of those rods if you tried. Play the fish just exactly the way you normally would. Playing a fish too long is much worse for the fish than having a small hook left in its mouth after breaking a tippet, but still, the goal should be to release the fish AFTER having removed the hook, and with the fish still in very good condition. You take care of the fish and let the rod take care of the tippet. Zero fishing is not a big fish pursuit. It is the ultimate in ultralight, though, and it really does present the bait or fly as close to the way a natural nymph or worm or egg drifts down a stream as you can possibly get. You will fool an awful lot of fish that way! I saw one pair of anglers on the stream that day. As they were walking out I asked how they did. Between the two of them, they'd caught one fish. I didn't keep count of the fish I'd caught, but it was easily a many day a couple times over.